Remove and discard excess fat from chicken. In 4-quart Dutch oven, place chicken, giblets (except discard liver) and neck. Add celery, carrot, onion, parsley, salt, pepper and water. Cover; heat to boiling; reduce heat. Simmer about 2 hours or until juice of chicken is clear when thickest part is cut to bone (at least 165°F). 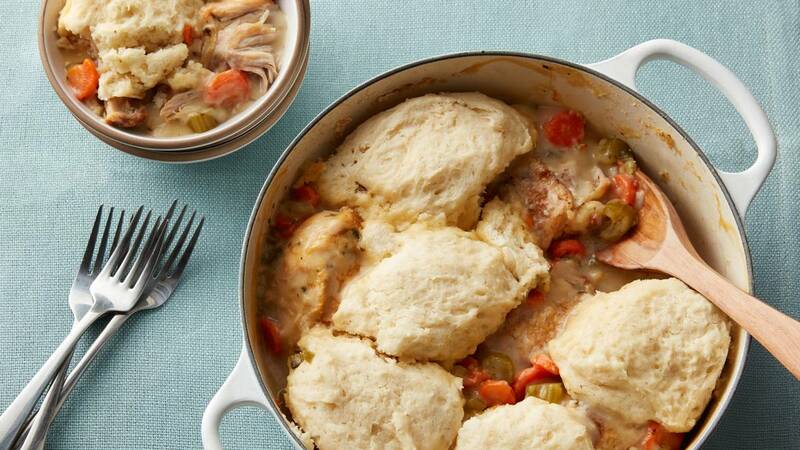 Remove chicken and vegetables from Dutch oven. Discard giblets and neck. Skim 1/2 cup fat from broth; reserve. Transfer broth to large bowl; reserve 4 cups (reserve remaining broth for another use). In Dutch oven, heat reserved 1/2 cup fat over low heat. Stir in 1/2 cup of the Bisquick™ mix. Cook and stir until mixture is smooth and bubbly; remove from heat. Stir in reserved 4 cups broth. Heat to boiling, stirring constantly. Boil and stir 1 minute. Add chicken and vegetables; reduce heat to low. Heat about 20 minutes or until hot. In medium bowl, stir remaining 2 cups Bisquick™ mix and the milk with wire whisk or fork until soft dough forms. Drop dough by spoonfuls onto hot chicken mixture (do not drop directly into liquid). Cook uncovered over low heat 10 minutes. Cover and cook 10 minutes longer.